Alaska Travel – 3 Tips to Making It Real! featuring guidelines for picking where to stay. from iTunes, will guide you to travel information you can carry with you. of the inn keeper’s home but are separate from the owner’s living space. Everyone is unique and private. tour or feature you might select for the day. well-traveled selections? Let us know. tub, freezer space for your fish, or the ‘going green’ commitment to the environment. Ask your B&B host about this. Partners. We work together to build great memories of your Alaska travels! AABBA. Mary samples the day cruises, train rides, glacier tours, walking & hiking trails – oh, and the restaurants, too! 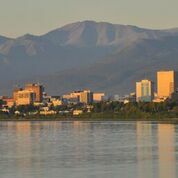 Just ask what Anchorage can offer you! Follow her Anchorage travel suggestions on Facebook.